With a stay at Ramada Resort Phillip Island in Ventnor, you'll be in a regional park and close to Phillip Island Grand Prix Circuit and Phillip Island Winery. This 4-star resort is within the vicinity of Purple Hen Winery and Penguin Parade. Make yourself at home in one of the 110 guestrooms, featuring kitchens with full-sized refrigerators/freezers and stovetops. Rooms have private furnished patios. Flat-screen televisions along with DVD players are provided for your entertainment. Conveniences include phones, as well as microwaves and coffee/tea makers. Dip into one of the 2 outdoor swimming pools or enjoy other recreational amenities including outdoor tennis courts and a sauna. Additional features at this resort include wireless Internet access (surcharge), an arcade/game room, and wedding services. Enjoy a satisfying meal at a restaurant serving guests of Ramada Resort Phillip Island. Quench your thirst with your favorite drink at a bar/lounge. Buffet breakfasts are available daily from 7:30 AM to 10:30 AM for a fee. The front desk is staffed during limited hours. Planning an event in Ventnor? This resort has 2519 square feet (234 square meters) of space consisting of a conference center and meeting rooms. Free self parking is available onsite. 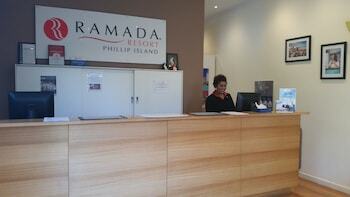 Ramada Resort Phillip Island is an amazing Ventnor lodging choice for your trip to Australia. With numerous amenities for guests such as fitness center, jacuzzi or spa, game room, you will wake up at Ramada Resort Phillip Island feeling invigorated every day for your time in Ventnor. Don’t let this amazing reservation opportunity pass you by, book your stay at Ramada Resort Phillip Island today to make the most of your time in Ventnor, Australia.